CRYSTALS have healing properties, says Sage. Sage Machado’s boutique is filled with one-of-a-kind jewelry, her handmade essential oils and favorite finds from around the globe. 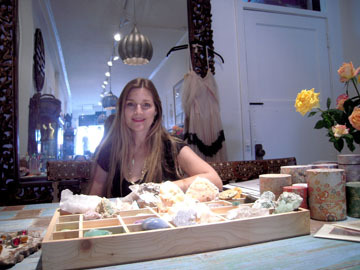 She opened her Bohemian-style store, The Sage Lifestyle at 128 ½ N. Larchmont Blvd. after moving to the neighborhood. “I’m new to Larchmont but not new to the business,” the energetic mom of two young daughters said. Her line of perfumes and candles, made in small batches, are named after the gemstones she loves—garnet, topaz, onyx and others. Jewels are infused in her sea-inspired Mermaid Soul collection to Empress, made of 14k rose gold, sapphires and diamonds. 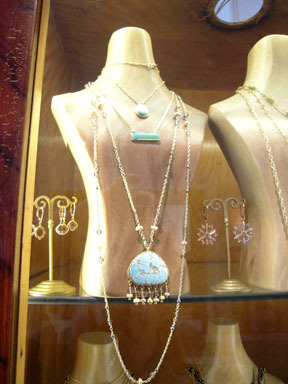 There’s the more casual “yoga line” Tibetan Cowboy, and Native American turquoise and 19th century cameos are in her reworked vintage pieces. Crystals and gems sparkle from a box for custom works. One client going through a divorce had a necklace made of rose quartz, said to heal a broken heart. NECKLACES are made of Native American turquoise. Larchmont Village is more her style, where she offers originality and beauty in an overly mass-produced, made-in-China retail world. “I started as an artist… that passion transcends into the pieces,” she explains. Madonna, Julia Roberts, Kate Hudson and other celebrities took notice, and she developed a following at her former shop on Beverly Blvd. Art by actress Melora Walters hangs on the walls and hand-printed cards, textiles and baskets from around the world fill the shelves. Almost everything in the store is for sale, from vintage clothes to a 1920s console table from India. Prices vary from $13 to $56 for a candle to $45 to $2,000 and up for jewelry. “We have something for everybody,” says Sage.